Record low interest rates have led to concerns about the potency of monetary policy in future recessions. In a recent working paper, Kiley and Roberts (2017) estimate that the zero lower bound on nominal interest rates will bind 30-40% of the time going forward. A key question for macroeconomic policy is therefore whether lowering interest rates below zero can be an effective tool for stimulating aggregate demand. 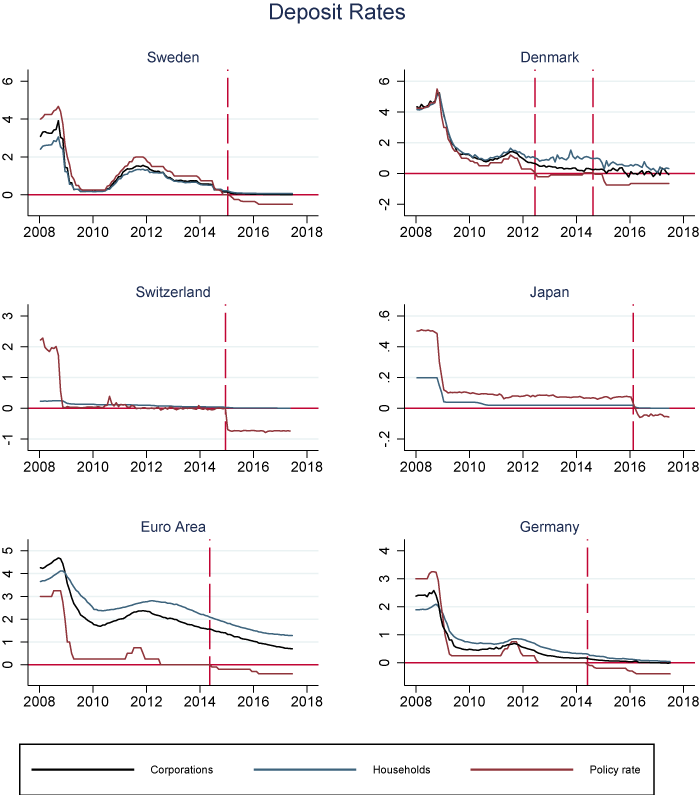 From 2012 to 2016, central banks in Switzerland, Sweden, Denmark, Japan, and the euro area reduced their key policy rates below zero for the first time in economic history. These policies have been controversial. Some argue that there is nothing special about negative interest rates. For instance, the Swiss National Bank declared that “the laws of economics do not change significantly when interest rates turn negative” (Jordan 2016). Others are sceptical. Waller (2016) dubbed the policy a “tax in sheep’s clothing”. To date, there is no consensus on the effectiveness of negative nominal interest rates – either empirically or theoretically. In our recent paper (Eggertsson et al. 2017), we contribute to filling this gap. To understand the effectiveness of negative policy rates, it is important to know the extent to which they are transmitted to bank interest rates. Due to an apparent zero lower bound on deposit rates, negative policy rates have so far had very limited impact on the deposit rates faced by households and firms. Furthermore, the lower bound on the deposit rate seems to be causing a decline in pass-through to lending rates as well. In Figure 1, we plot deposit rates for six economic areas in which the policy rate is negative. Starting in the upper left corner, the Swedish central bank lowered its key policy rate below zero in February 2015. Deposit rates did not follow the central bank rate into negative territory. Instead, deposit rates for both households and firms remain stuck at, or just above, zero. A similar picture emerges for Denmark, as illustrated in the upper right corner. The Danish central bank crossed the zero lower bound twice, first in July 2012 and then in September 2014. As was the case for Sweden, the negative policy rate has not been transmitted to negative deposit rates. Similar patterns exist in both Switzerland and Japan, as shown in the middle row of Figure 1. Deposit rates in the euro area follow a somewhat different pattern, as depicted in the bottom row. The ECB reduced its key policy rate below zero in June 2014. As seen from the left panel, aggregate deposit rates are high in the euro area and therefore have more room to fall before reaching the zero lower bound. Moreover, the deposit rate does not normally follow the policy rate as closely as in the other cases we consider. One reason for this may be the underlying heterogeneity of the euro areaWhen considering the Euro Area it is worth noting that the negative interest rate policy was implemented together with a host of other credit easing measures, some of which implied direct lending from the ECB to commercial banks at a (potentially) negative interest rate. That policy is better characterized as a credit subsidy rather than charging interest on reserves, which the commercial banks hold in positive amounts at the central bank.. Looking at Germany only (shown in the bottom right of the figure), we see a similar pattern emerge as in the other countries. That is, despite negative policy rates, the deposit rate appears bounded by zero. Because lending rates are higher than deposit rates, they have more room to fall before reaching zero. Still, the effect of negative policy rates seems limited. There have even been reports of increased lending rates, especially from Switzerland (Basten and Mariathasan 2017). 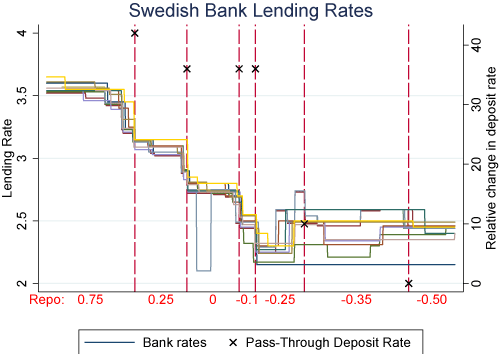 We use novel bank-level interest rate data from Sweden to show that the pass-through to lending rates collapses once the deposit rate is stuck at the zero lower bound. In Figure 2 we plot bank-level mortgage rates for thirteen financial institutions. On the vertical axis we report the policy rate level (i.e. the repo rate), which starts out at 0.75 in mid-2014 and ends up at -0.50 in mid-2016. Each vertical line represents a policy rate cut. While the deposit rate was fairly responsive for the first four policy rate cuts, there was virtually no pass-through to deposit rates for the last two policy rate cuts (illustrated by the small crosses). As seen from the figure, the lack of pass-through to deposit rates coincides with a clear break in the pattern for lending rates as well. Before the deposit rate stopped responding, banks reacted to policy rate cuts by homogenously reducing their lending rates. Once the deposit rate stops responding, however, this is no longer the case. While there is some initial reduction in lending rates after the policy rate turns negative, most of the rates increase again shortly thereafter. As a result, the total impact on lending rates is limited. We believe that the lack of pass-through to deposit rates – the most important funding cost for banks – is crucial in explaining the lack of pass-through to lending rates. If monetary policy is less able to influence the funding costs of banks, it is less likely to affect banks’ willingness to lend. The response in aggregate deposit rates is relatively large and stable for the first four policy rate cuts in our sample. For the two last policy rate cuts, the response in the deposit rate is very limited. This lines up well with the low average response in lending rates for the final two policy rate cuts. Standard macroeconomic models used to analyse monetary policy cannot capture this simple intuition. Such models often have only one interest rate controlled directly by the central bank, or they implicitly assume that the lending rate is independent of the deposit rate. Building a model that can be used to analyse the effectiveness of negative nominal interest rates therefore requires some alterations relative to what is common in the literature. At a minimum, such a model needs to recognise the role of money as a store of value, give a role to banks in order to allow for separate lending and borrowing rates, and have a well-defined policy rate that may differ from the rates depositors and borrowers face. In our paper, we outline such a model in a closed economy. Monetary policy is implemented by setting an interest rate on reserves and using the supply of central bank currency to affect the deposit rate, which is also the funding cost of banks. If the central bank lowers the reserve rate and ensures that there are sufficient reserves in the system, this in turn lowers the deposit rate. The reduction in the deposit rate stimulates the consumption of savers. In addition, lowering the deposit rate reduces banks’ funding costs. This increases their willingness to lend, putting downwards pressure on the borrowing rate and thereby stimulating the consumption of borrowers. Hence, the reduction in the reserve rate leads to a reduction in the other interest rates in the economy, stimulating aggregate demand. With negative policy rates, however, central bank policy becomes far less potent. Due to the lower bound on the deposit rate arising from the existence of cash – and observed in the data, lowering the reserve rate below this bound and into negative territory has no effect on the deposit rate. Further, when the central bank can no longer affect the deposit rate, there is no stimulative effect on banks' funding costs, and so no increase in their willingness to lend. As a result, there is no longer a boost to aggregate demand. In fact, to the extent that there are agency costs between banks and their creditors, the erosion of bank profits may cause negative interest rates to be contractionary. In our model, negative interest rates are not effective in stimulating aggregate demand due to the lower bound on the deposit rate. However, if this bound were to be lowered or removed, there would be more room for expansionary policy rate reductions. More than a hundred years ago, Gesell (1916) proposed a tax on paper currency. Gesell's proposal would essentially make households less willing to hold cash, and could therefore allow banks to impose negative deposit rates on their customers without losing their deposits. Other possibilities include a ban of higher denomination bills, abolishing cash completely, or letting reserve currency and paper currency trade at different values (Agarwal and Kimball 2015, Rogoff 2017). The main takeaway from our analysis is not that negative interest rates are always non-expansionary. Rather, it is that given the current institutional set-up there appears to be limited pass-through of negative central bank rates through the bank sector, an important part of the monetary policy transmission mechanism. This highlights the need for alternative policies or changes to the current institutional set-up in order to fight the next recession. Agarwal, R, and M Kimball (2015), “Breaking through the zero lower bound”, International Monetary Fund. Basten, C, and M Mariathasan (2017), The Effects of Negative Interest Rates. Eggertsson, G, R Juelsrud and E G Wold (2017), “Are negative nominal interest rates expansionary?”, NBER Working Paper 24039. Gesell, S (1916), The natural economic order, translated by Phillip Pye, 2002. Jordan, T (2016), “Monetary policy using negative interest rates: a status report”, Swiss National Bank discussion paper. Kiley, M, and J Roberts (2017), “Monetary Policy in a Low Interest Rate World”, Brookings Papers on Economic Activity. Rogoff, K (2017), “Dealing with monetary paralysis at the zero bound”, The Journal of Economic Perspectives, 31(3), 47 – 66. Waller, C (2016), “Negative interest rates: a tax in sheep’s clothing”, discussion paper.